​The Ayrfire polypenco pipe chanter is designed by Colin MacLellan and has enjoyed great popularity and success since its launch a short time ago. Intended as a very inexpensive option to other solo pipe chanters, the Ayrfire has seen success at the very top competitions at the Argyllshire Gathering and the Northern Meeting in Inverness. 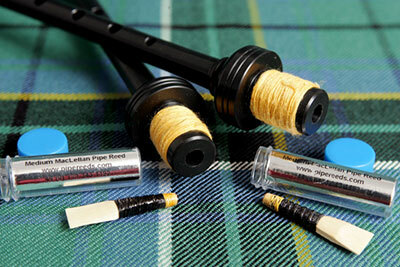 A bold, broad, warm toned instrument, it is pleasingly pitched for both solo and band use; each chanter comes with optional softwood chanter cap, and all come reeded with a Colin MacLellan pipe reed of your choice of strength. ​The Ayrfire is the only pipe chanter which comes with the option of a round high G hole or an elongated high G hole for ease of gaining a great high G for piobaireachd players. Renowned during his piping career for the tone of his bagpipe - play exactly the same instrument as Colin plays and what he considers the best chanter ever made - The Ayrfire!